The range of colors that we bring in from our tomato bed wins me over every summer. Some varieties we grow every year, and maybe it is just thanks to Minnesota’s long winter, but I experience those first ripe tomatoes like I’m seeing them for the first time. The vibrant pink, the deep red, the soft yellow, the shiny purple, the glowing orange, all the many shapes and sizes! It makes me giddy. 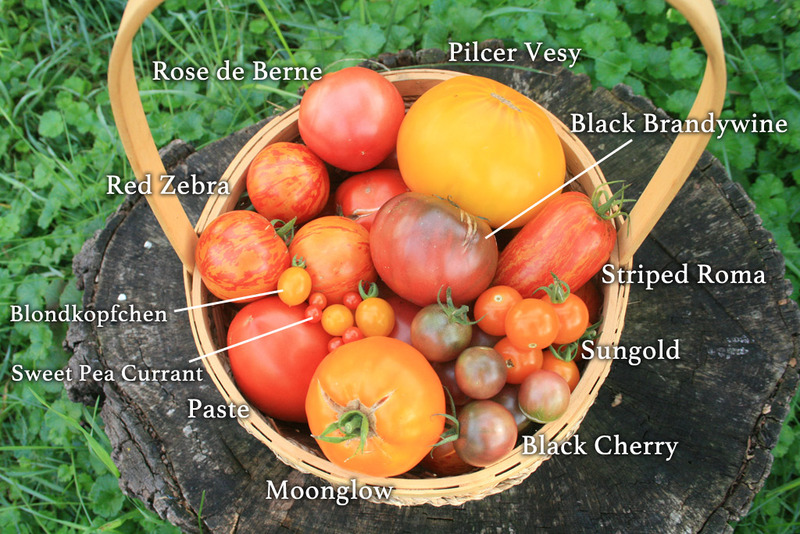 Since I’ve been mentioning those tomatoes not too infrequently here, I thought I’d share some of the varieties our family holds dear. 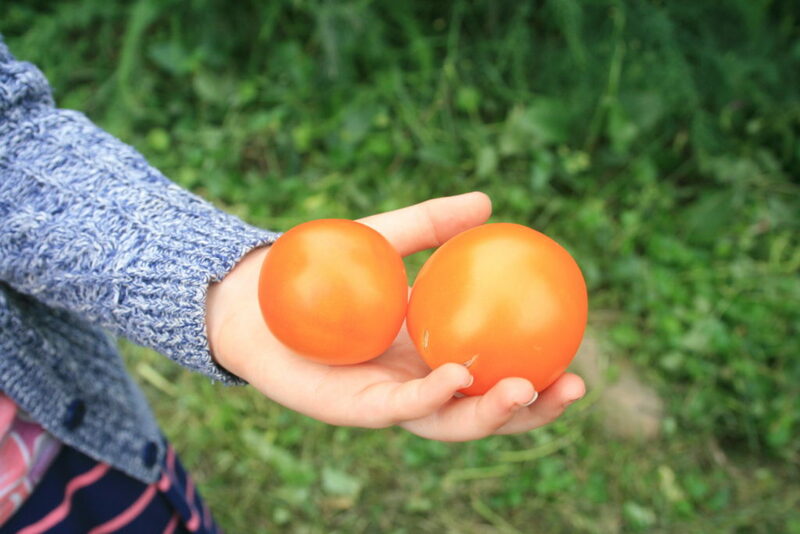 There are lots of #1 reasons to grow your own food, and homegrown tomatoes are up there! With today’s modern processing and shipping of produce, you simply can’t get anywhere close to that homegrown taste from the grocery store. Local farms are a second best, but even they can’t hand you one warm from the sun. Each year we grow about 15 varieties of tomatoes, and I think that number will only grow. It is too difficult to decide which ones to cut out, and I just don’t need to, really. We grow about 45 tomato plants from seed. Roughly half of those are paste tomatoes for making tomatoey goodness to last us all the year, including that roasted salsa I made the other day. Somewhere around six of those are different varieties of snacking tomatoes to keep hunger at bay while outside. 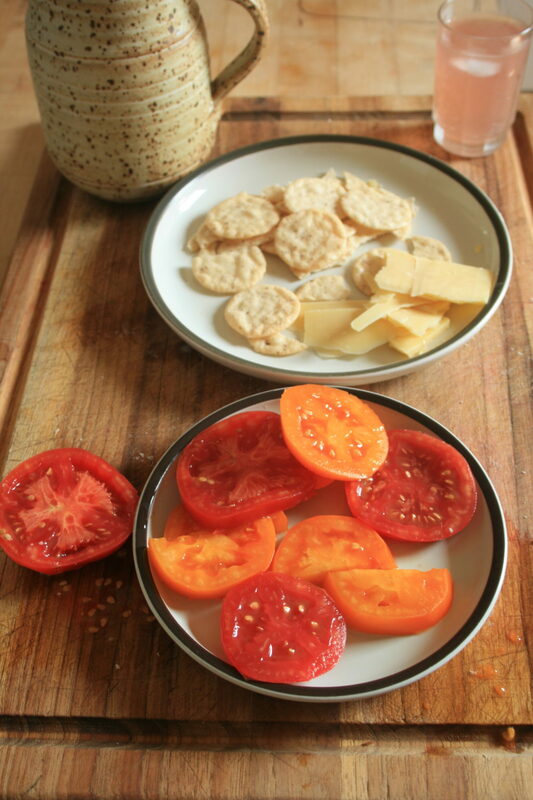 A few are good tomatoes for dehydrating – just the right size for a garden pizza in the dead of winter! The rest are a delightful array of juicy slicers for summer salads like the one in this post. We keep it colorful and the variety of sizes keeps it fun! 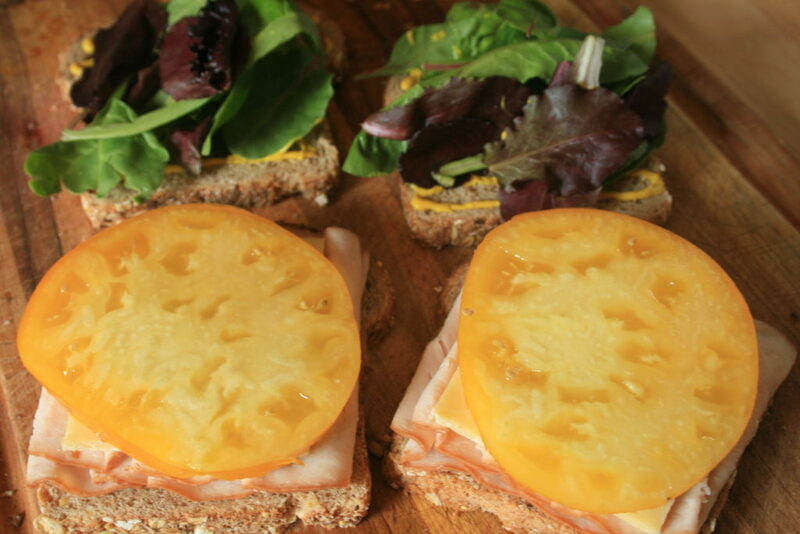 Would you like some turkey with your tomato sandwich?! 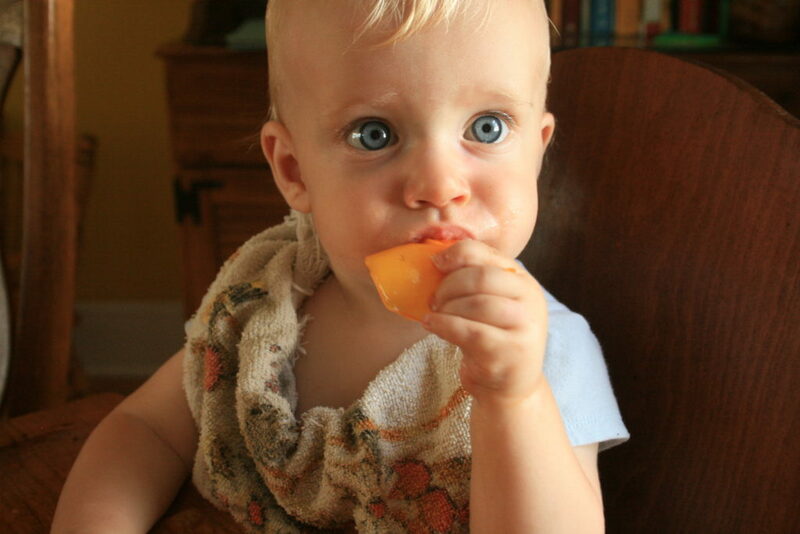 Needless to say, about this time of year, juicy slicers accompany most meals, and make up many snacks. Just a little salt and you’re golden. *Not pictured in the basket, but you can see Jaune Flamme in R’s hand up above. 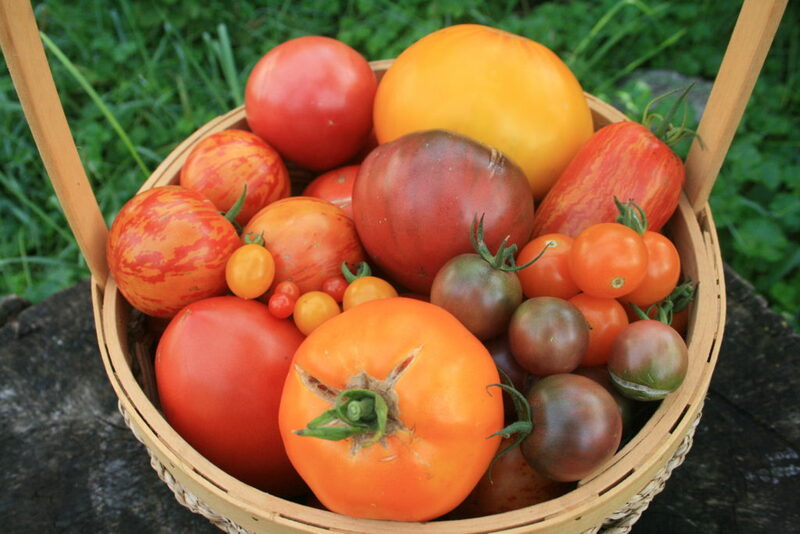 Please share your favorite tomato variety in the comments. I’d so love to hear! I didn’t even know there were tomatoes especially good for drying! Which ones are they? Also what’s your process for seed saving? This is the first time in many years that I have had the right spot for tomatoes so I have been keeping notes which do better than others but I never even thought about saving the seeds! I enjoy your posts! Thank you. I like to dry the Jaune Flamme tomatoes pictured in my little girl’s hand. They have a thick enough skin that they hold up real well when being sliced for the dryer. They are sweet and so flavorful when done. And really, I just like the medium size for storing them in jars and using them on our pizza 🙂 You can dry any tomatoes, of course. But you will have better results with meatier varieties. Nice that you’ve been keeping notes! Check out tendedapp.com if you are interested in a place to keep those notes organize for coming years. As far as saving seed, it is a hefty topic for another post! You can be very by the rules to ensure integrity of your seed variety, or you can just grab those seeds out of your next tomato, give them a rinse and let them dry. I recommend doing a little reading on the topic to decide how by the book you are willing to be. For a detailed resource, check out this book by Suzanne Ashworth: Seed to Seed. Happy tomato eating!